Who doesn’t like goats cheese? 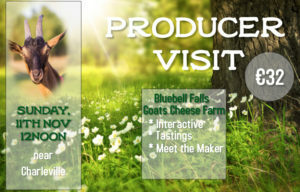 Bluebell Falls is an award-winning goats cheese made near Charleville by Victor and Breda O’Sullivan. The goats are happy animals, grazing the green pastures and love to see visitors coming to the farm. 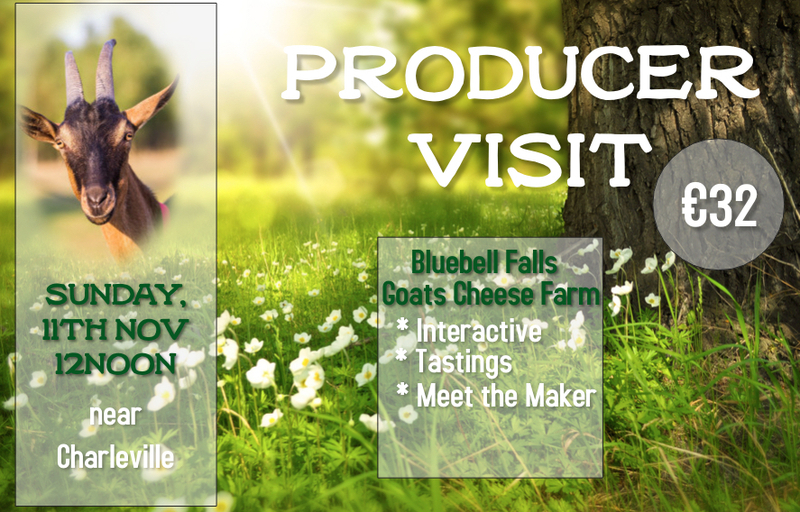 Join us on our Visit to Bluebell Falls Goats Farm. Victor O’Sullivan will be our host on Sunday, 11th November. Victor will welcome us with a glass of goats milk before leading us around the farm. He will share his journey of becoming a goats farmer while introducing us to the goats. We will see where the goats are being milked before we head to the cheese room where guests can try their hand on creating their very own flavoured cheese to take home. Drinking the milk and eating the meat is optional but we cannot cater for allergies/diets. Please note that this is a working farm and appropriate clothing and footwear is essential. Please note: Tickets are non-refundable but can be transferred to a third person.